"Is this permanent, you being back?" Oliver asked Sara tonight after she came to his aid. "We'll see," she said with a smile, that seems almost sadly knowing when you watch it through the second time. Of course, we didn't know during this friendly reunion between Oliver and Sara that it might be their last conversation. Oliver set off not long after, so he was presumably busy giving Barry Allen some rooftop advice during Sara's final, brutal scene. After a brief reunion with Oliver, Sara later met with her sister Laurel on a rooftop -- I expect rooftops are where all masked people do all of their meetings -- and the two had their own warm reunion, complete with hugs and a "Love you" from Laurel, after which she left and an unseen person said "Hello Sara" in a gravely voice. "What are you doing here?" Sara responded. "He" answered by shooting her full of arrows and sending her over side of the roof where she plummeted to the ground. Her eyes were open and it seemed pretty clear that she's dead. Mostly dead? Dead for now? Or all dead? Unfortunately, it seems like the latter. For the record -- (and possible vague spoiler alert) -- we were told during Comic-Con that Caity Lotz would be in Season 3 in a recurring role, and that she was signed on for at least three episodes (possibly more). But that may not be any kind of spoiler, when we consider that factors into the flashbacks pretty prominently. Tonight's episode might have been the last time we see Sara alive in the present day, but it seems likely that we'll see her in some form or another in the future. So, who's the killer? Are we assuming it's Ra's al Ghul? The DC super villain and League of Assassins leader is confirmed to be Season 3's Big Bad, and he does have known associations with Sara. But would he kill her and why? Or maybe the question is, why kill her while she just happens to be in Starling City? Because she's away from Nyssa? Because he's sending a message to Oliver? We'll have to wait and see if that proves to be relevant. Assuming it's Ra's al Ghul that did it. Maybe that's too obvious a guess? Cliffhanger! 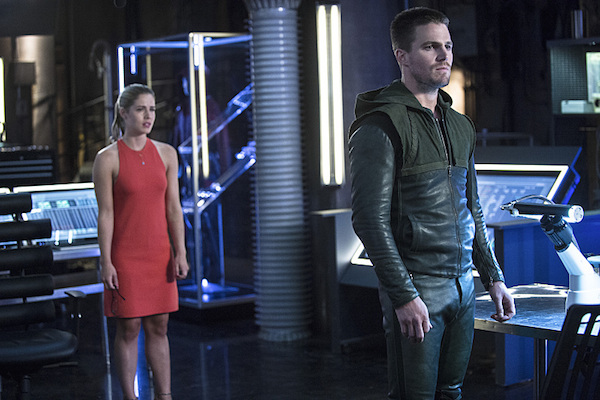 Tonight's episode really was an emotional roller coaster ride, with Oliver making an attempt to set his mask aside and pursue his own interests for a little while -- Felicity being the primary interest. Of course, their first date proved to be explosive, as Vertigo blew up the restaurant. Felicity was fine, but between that and facing Vertigo and seeing his worst fear -- himself without the mask -- Oliver knew the only choice to make was to wear the mask. Or maybe he never had a choice. A man can not live by two names, after all. Oliver Queen is Arrow. Oliver and Felicity's date lasted just long enough for them to acknowledge the connection they've had, pretty much from the start. But they both knew it was over. Oliver's parting words to Felicity were, "Don't ask me to say that I don't love you." Felicity was the one to walk away. So, is this never say never? That door's definitely not closed all the way. But it's closed for now. Let the tension ensue... especially now that Brandon Routh's Ray Palmer has arrived, in all his brainy, hacker-hot glory. How long before Felicity pushes forward and finds herself on a date with Ray? As for Diggle, he's a father! And his whole universe has changed. It seems like he's taken the other road. His mask is off and his Dad-hat is on. For now anyway. Let's see how that works out, not only for Diggle but also for Lyla. Both are soldiers. Will they be content to settle down and put family first? We'll see. No sign of Thea yet, but Roy appears to be keeping busy -- kind of in the background, but present -- taking orders and breaking in his Arsenal gear.